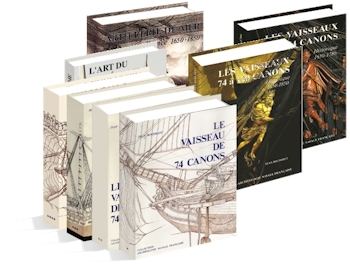 The collection created by Jean Boudriot in the 1970s with the publication of Vaisseau de 74 canons in 4 volumes now features 62 titles and nearly 80 volumes all dedicated to sailing ships of the Classical period (1650-1850). Today, we are offering the possibility of ordering monographs and studies by Jean Boudriot representing all types of ships: warships, merchant or slave ships, frigates, corvettes, brigs, cutters, schooners, galliots, luggers and xebecs. We also had the pleasure of publishing excellent works and monographs by David Roberts, Gérard Delacroix, Jean-Claude Lemineur and Franco Fissore based on the same principles. In addition to all these works, Commandant Alain Demerliac entrusted us with publishing his indispensable Nomenclatures des navires français. The collection also includes books that can no longer be found or first prints of original manuscripts to researchers and scholars wishing for access to basic works as well as model makers looking for serious documentation. NB: For shipping conditions, see “Nos livres” (our books), then “Informations pour commander” (information for ordering).